If this is the year you’re determined to turn back the clock and undergo a facelift, consider a much less invasive alternative before you go under the knife. Euro Laser Spa Services on Purdy Avenue, which stays on top of the rapid advancements in anti-aging, recently introduced FDA-approved medical skin threading that promises to be a natural alternative to a facelift offering immediate and lasting results without the downtime and risks of surgery. “It’s definitely the way of the future,” said Liz DiBartolo, owner of Euro Laser Spa Services. Instead of removing sagging facial skin with surgery, medical skin threading, better known as a thread lift, involves injecting tiny sutures into the skin that pull and tighten the underlying dermis to create a lifting effect. This can be performed around the eyes, lips, jowls, forehead, chin, and even neck. The threads also stimulate the production of collagen that helps improve the skin’s hydration, firmness and tone. The result is a youthful yet natural look. The thread lift itself isn’t new, but the methods have improved dramatically. In the past, the procedure involved permanent barbed sutures that could cause scarring and infections, but the sutures now are comprised of polydioxanone (PDO) which is used in cardiovascular surgery and absorbs into the skin. After six months or so, the threads dissolve. DiBartolo and Dr. Adam Messenger, the Spa’s medical director since 2012, did their homework to find the right company with the best products for thread lifts and zeroed in on the Madrid-based Medyglobal “because of its outstanding reputation and long history.” After traveling to Miami late last year to train with Medyglobal professionals and become certified in the procedure, the pair decided to bring the products to Rye. “Safety is at the top of our scale,” said DiBartolo, noting that Medyglobal PDO threads have been FDA-approved for four years. Dr. Messenger, a physician with Greenwich Hospital with extensive experience with injections of a similar nature in the hospital environment, performs the procedure. He explains that there are different sized needles — some as small as acupuncture needles — depending on the area to be treated and the amount of facial volume loss from aging. He begins by using a numbing agent – topical for the smaller areas and a lidocaine injection for the larger ones — and then marks the area to be treated and inserts the threads. The entire procedure is very quick. Treating the vertical lip lines takes no longer than five minutes. There can be some initial irritation and redness at the injection site. Results can be immediate with the full effect manifested in 21 days. Since Euro Laser introduced the procedure early this year, results have been overwhelmingly successful. Euro Laser has also introduced Mesotherapy, a technique that injects vitamin C and peptides into the skin. “It goes right to the heart of the dermis, getting right to the source,” said Dr. Messenger. “It’s all-natural and great for maintenance,” added DiBartolo. 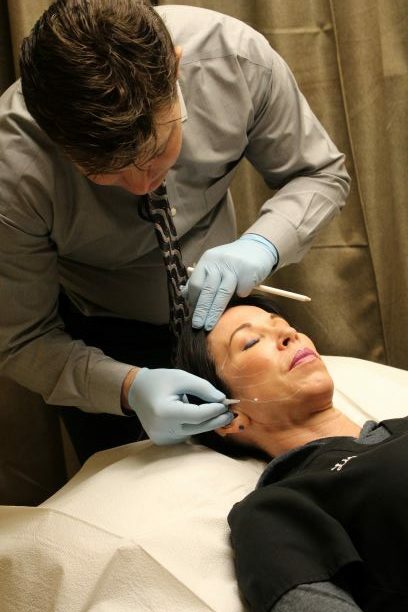 Dr. Adam Messenger demonstrating Euro Laser’s newly-introduced thread lift procedure with Liz DiBartolo, owner.